My name is Zach, I’m a sophomore computer science student and research assistant at Southern Illinois University Edwardsville. I’m also a gamer, so when I saw the project suggestion I was excited to get the excuse to play with OpenGL and figure out how it works. I’d done some work with it in the past for 2D applications, but I haven’t played with it in 3D. By the end of the summer I no doubt expect to have a firm grasp of it at the very least. Check out my github. 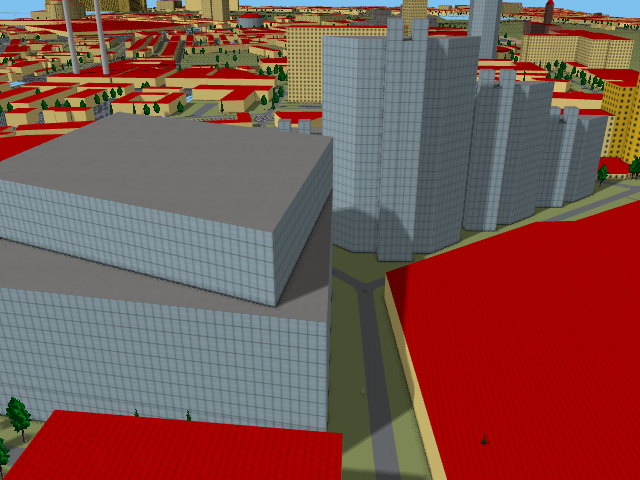 By default OSM2World doesn’t use any textures, and has shadows disabled. There is an existing “texture pack” that contains the textures used to generate this map. My first step was tracking that down, its here (Basti sent it to me, so it wasn’t actually that hard). To use it, the textures folder and properties file must be in the same directory as the built jar. After dumping those into my build folder, I was ready to go. I loaded up a map file and immediately crashed. I tried a few different map files until finally getting an empty parking lot to render, albeit with strange graphical issues. After crashing Java several more times, I moved from my underpowered laptop to my more powerful desktop computer (with an actual graphics card) and didn’t have any problems from there. 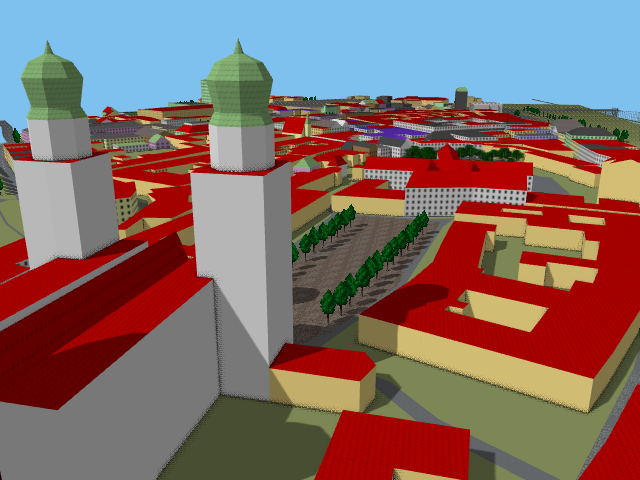 With this in mind, all of the changes that I plan to implement will be configurable so as not to make OSM2World unusable on a less powerful computer. I’d like to have the ability to change the time of day, many neat effects and images can be produced by moving the sun around and changing its color. I’m going to produce a small menu that lets you do just that, changing the time of day (or night) with a slider, and then calculating the appropriate angle and color of the sun and shadows. What I’m most excited about seeing is this picture. The second major component of my project is reflections. If this were a real image, you would see the reflection of the short building in the foreground on the front of the building behind it. On the right side of that same glass building, if the sun were in the right place, you would expect the shadow of the short building on the right to be illuminated by the sunlight reflecting off the glass on the tall building, potentially a glare hitting the camera. If you want a full breakdown of what I plan to do, have a look at the proposal, it includes a handful of other things I didn’t mention. If there’s anything you want to see, feel free to leave a comment here, send me a message, or open an issue on github, but I can’t promise anything until I get through the big stuff.